Showers redeveloping this afternoon across PEI..
Wednesday, October 17th 6:30am.. A strong fall storm moved across the northern Gulf of St Lawrence yesterday which resulted in the wind and rain. 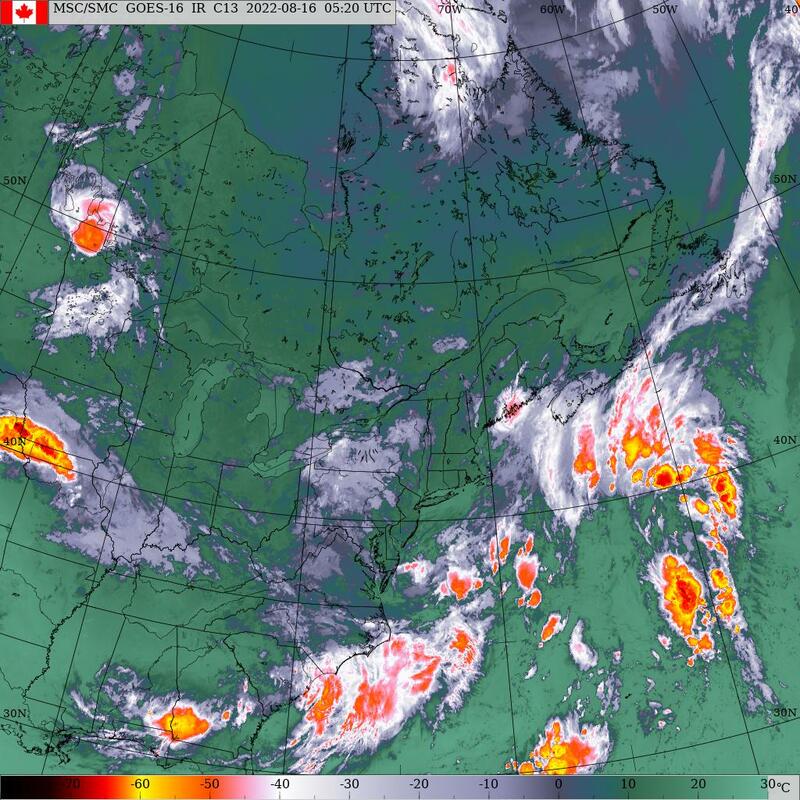 This system is now east located off the east coast of Newfoundland and continues to move away. A weak ridge of high pressure is now cresting over the island as it also moves east across the Maritimes. This feature should give some sunshine to the island for a few hours this morning but skies will cloud over this afternoon as another cold front approaches from the west with showers developing towards mid/late afternoon. The frontal passage occurs this evening with a wind shift to the west. This will usher in the coldest air of the season so far resulting in showers changing to flurries snow pellets/ice pellets by dawn tomorrow which will then continue all day Thursday. Some sunshine expected on Friday as a ridge of high pressure crests over the island. Clouds thicken up again later Friday as the next weather system approaches. This system will be much like yesterday ‘s storm passing across the northern Gulf later Friday accompanied by rain and strong winds. The associated cold front sweeps across the island near dawn on Sunday morning which will be accompanied by a wind shift to the NW resulting in falling temperatures and showers changing to flurries as the cold air returns. Clearing skies on Monday as a ridge of high pressure moves across. A warm-up accompanied by clouds and rain develop on Tuesday. Precipitation.. Showers develop mid afternoon today changing to flurries by dawn tomorrow. Flurries/snow pellets/ice pellets then continue off and on through the day especially down east. Friday generally dry. Showers develop near noon on Saturday becoming heavy at times Saturday night tapering back to showers near dawn on Sunday then to flurries. Dry MOnday. Rain on Tuesday. Temperatures.. Slightly below normal today, cold tomorrow and Friday. Warm-up on Saturday, cool down on Sunday, cold Monday, warm-up on Tuesday. Wind.. Light west winds increasing to brisk W-NW later this afternoon further increasing to brisk-strong NW tomorrow. Diminishing NW winds on Friday. Winds shift to SW on Saturday increasing to brisk-strong by evening shifting to the west near dawn on Sunday morning with the cold frontal passage. Brisk westerlies continue Sunday into Monday. Hazards. Wet driving conditions in showers beginning this afternoon which then continues overnight changing to flurries/ice pellets/snow pellets by dawn tomorrow. Windy continues again tomorrow evening may result in bridge restrictions. Long range is hinting at another rain/wind event for Saturday as well. Saturday.. Cloudy with rain developing near noon, increasing SW winds, highs 13 then steady overnight. Sunday.. Sunny west, cloudy flurries east brisk west winds, warmest part of the day will be sunrise with temps near 12 then falling to 6 by suppertime.